Brain haemorrhage. Coloured axial (horizontal) CT (computed tomography) scan through the head of a patient with an extradural haematoma (light blue, centre left). This occurs when an injury causes bleeding (haemorrhage) inside the skull (white), but outside the brain membranes. 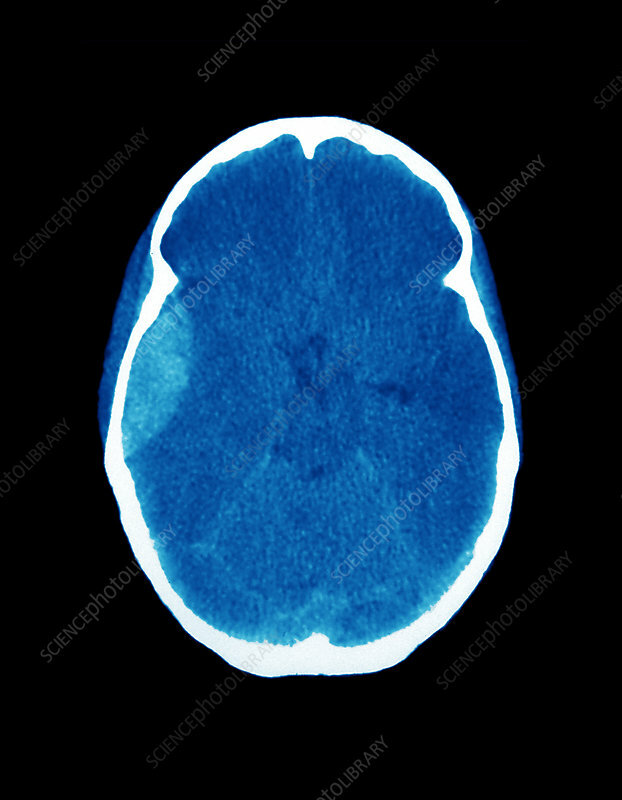 The blood rapidly clots to form a solid mass (the haematoma), which can be dangerous as it can put pressure on the brain (darker blue, inside skull). It is usually caused by an impact, in this case from a road traffic accident. The haematoma is in the right- hand temple region (this view looks up through the body, with the front of the brain at top). The clot will need to be surgically removed. CT scans use X-rays to image sections of the body.